We all know how important it is for people to be able to work with others and manage a team. Business students most certainly need these skills and so the vast majority of the business courses I teach involve some aspect of group work. Many of these teams are formed early in the term, sometimes in the first class, and are then expected to work together throughout the entire semester to produce a professional project worth a significant percentage of the final grade. With stakes as high as these, getting in a group that works is really, really important. But how to establish these groups? Some suggest random team assignment. This is “fair”, quick, and can give an opportunity for students to work with people they otherwise wouldn’t have. Since you don’t always get to choose your coworkers, this also gives students a chance to learn how to manage an assigned team. I prefer to have students choose their own teammates. I like the responsibility of selection to be theirs as then the outcomes of their choices are also their responsibility. I also feel that by giving students a chance to form their own teams helps them to feel in greater control of their learning, and hope that with greater control comes stronger motivation. Since teams are formed in either the first or second week of most of my classes, the students barely know each other and making informed team selection decisions is challenging. I started by having students simply “mingle” until they formed a team of the required number of students. They invariably chose the people who happened to sit near them on the first day. With results little better than the random assignment, and after many terms of trying to coach teams of ill-suited classmates, I decided that a little bit of time invested early could help all of us to realize a more successful outcome. Here’s the activity as it unfolds in my classes. Step 1: Learn from Past Experiences – What don’t you like about group work? – 5 min. Slackers – they are either just lazy, or are in the class as an elective and don’t care as much as the students who are in the course for their program, are aiming for a “C” when the team wants an “A” etc. Meetings – really everything about them. From scheduling, to sticking to the topic at hand, to coming prepared, or attending at all to simply having to have them etc. Personality issues – bossy people, people who don’t speak up, procrastinators, people who want things done early, etc. Knowing how you like to work – Do you prefer meeting face to face? Working in wiki? A discussion board? Do you want to communicate by text? email? Facebook? Twitter? Considering your schedule – When are you available? This is a practical consideration but really important for the success of a team. I then ask students to make a few notes on what they want out this new team experience. Next is an introspective few minutes. I ask students to think of the best 3 assets that they bring to a group. Perhaps they are spectacular writers, researchers or a wiz with numbers. Maybe they are tech geniuses, super creative, have a knack for engaging presentations etc. Next, I give a brief argument for how diverse teams are stronger. In fact, just after I made this argument at the start of this summer term, Harvard Business Review was kind enough to support me with a post on the subject. I then supplement the creativity aspect with a “strength in numbers” argument suggesting that team members with skills different from their own can be great assets. I then ask them to consider their 3 greatest weaknesses related to the project. Knowing where they need help, they can then be ready to look for team members that will compliment their skills and support the areas in need. Most of my classrooms are configured in 4 rows of tables and chairs. I ask the row second from the back, the 3rd row, to turn their chairs and face those sitting behind them. I then ask the front row to turn and face the people sitting behind them in the 2nd row. If there are empty chairs, I ask students to move so that the maximum number of pairs is set. If you have an odd number of students one person will start opposite an empty chair. That’s okay. In a few moments it will sort itself. When the racket of movement and giddy chatter subsides, I give the rest of the plan. I move to the light controls for the classroom and turn off the lights if they won’t settle. (I know, it’s like grade school but it gets attention better than shouting.) I ask the back row to raise their hands. I ask them to point to their left and explain that each time the lights go out, they are to stop talking, and move one seat to the direction they are pointing. The person in the furthest left spot will move to the front row spot directly in front of them. I then ask the front row to raise their hands and point to their left. Like the back row, when the lights go out, they are to move one chair to their left. The person in the furthest left spot moves to the back row to the spot directly in front of them. The students in the outside of the class continue in this pattern, moving in a circle around the room, 1 chair at a time. The students in the 2nd and 3rd rows remain in their seats. 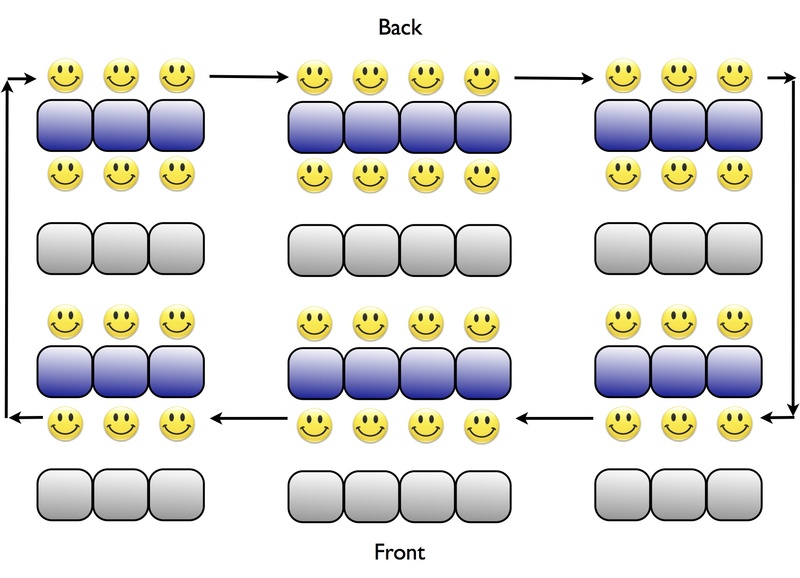 The movement pattern in my class looks like this, with blue desks shared and active, and grey ones abandoned. I explain that when we start, they will have 1 minute to conduct their interview with the person currently opposite them. When the lights go out they will begin the interview of the next candidate. I ask for any last-minute questions, ask everyone to put electronics and packs out of the path of traffic and set them off. With 35 students, and one minute per interview, (and 10 seconds or so for transition) the students are back in their original positions after 18 rounds or about 21 minutes. Step 3: Team Formation – 5 min. With everyone in their original positions I explain that they have now met half of the people in the class. If, during their interviews, they have one found one person with whom they’d like to work, then between the two of them, they know everyone in the class. (If you were a mover, you met the sitters. If you were a sitter, you met the movers. Together, a sitter and a mover know everyone!) I then set them free to form groups of the number required for the class. When they have the required number of members I ask them to sit down and get them started on working out the schedule, code of conduct, contact procedures and info for their group. I’ve been doing this for several years now. I’ve had good reports from students but then, the ones that didn’t find it helpful aren’t as likely to speak up. Now’s your chance. If you are a student who experienced it, what did you think? Should I keep it or scrap it? If I should scrap it, what do you suggest I change? What should I do instead? If you are an instructor who has other ideas about forming groups I’d love to hear them. After all, I’ve been using this for a while and I can always use some new material. If you try it, let me know how it works for you. « Vote Now! – What is Marketing Information Management All About? This is most helpful and your detailed description is much appreciated. This is timely as I’m heading into my third week, which is time to think about forming teams. I’ve “surveyed” the class and most of them prefer forming their own teams. Speed dating sounds like a great idea. Your suggestion on discovering yourself first before heading into the speed dating exercise is especially valuable. I also think the goal setting part is important to articulate early on to avoid mixed expectations. At the other institution where I teach, they have prepared a “team charter” hand-out for students as reference. It lays out the points to think about, and an example of a charter/agreement. It gives the students the flexibility to set their own rules and guidelines. I have used this as an assignment so that they will all do it. With a full load of 4 classes this summer, a systemized approach like this is ideal. Thank you so much for sharing your ideas here! Thanks Kenneth. Let me know how it goes. I’m interested in the Team Charter hand-out. In the OB classes we spend a considerable amount of time looking at the dynamics of groups and teams and so I have resources to support the lesson which lead to the groups building a team charter. For the marketing classes I haven’t got a system for getting this done quickly and effectively but I would really like to as I think it would be extremely helpful. Do you have the students submit their charters after they’ve built them? Do you allocate grades to this?